Reboot to EDL v1.1 is a small application for windows computer created by FirmwareCare.com Team, which allows you to reboot your Android Smartphone and Tablets into the EDL Mode. It supports all the major brands smartphone and tablets running on Qualcomm Chipsets including Samsung, HTC, Xiaomi, Huawei, LG, Motorola, Vivo, Oppo, Micromax, Nokia, Sony, Lenovo, OnePlus, Meizu. The Overall interface of the Tool is very simple and does what it meant for. It is very light on system and comes as a portable application. In order to use the Reboot to EDL, you need to install the Universal ADB Driver on your computer. 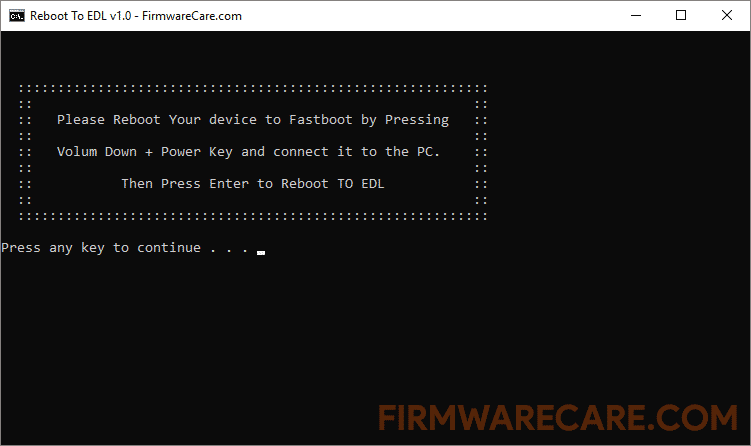 Now Reboot your Android device to the Fastboot Mode by pressing Volume Down + Power key. After that press Enter key from the computer to boot the device into the EDL mode. [*] Compatibility: The Reboot to EDL Application runs perfectly on Windows XP, Windows Vista, Windows 7, Windows 8, Windows 8.1 and Windows 10 (32 bit and 64 bit). [*] Credits: Reboot to EDL is created and distributed by FirmwareCare.com Team (developer). So, full credits goes to FirmwareCare.com Team (developer) for sharing the tool for free.